I know, I know.. I’m late with the weekly updates and I apologize for that! Being busy is really not an excuse here, because I always find time to cook. The most challenging aspect thus far about updating is taking the pictures! I move fast in the kitchen. And when I say fast, and I mean fast. Introducing the cam into the kitchen changed up the routine quite a bit. I chop, then snap a few shots, I chop some more and pause to take a few more shots. I burn the soup because I’m taking too many shots. I’m sure you all have wonderful imaginations but I guess it wouldn’t do much good to have a food blog without food now would it.. Lately, I have been interested in making sauces from scratch (namely red and white sauces) not only because fresher always tastes better, but also because it’s good to know how to make things from scratch. 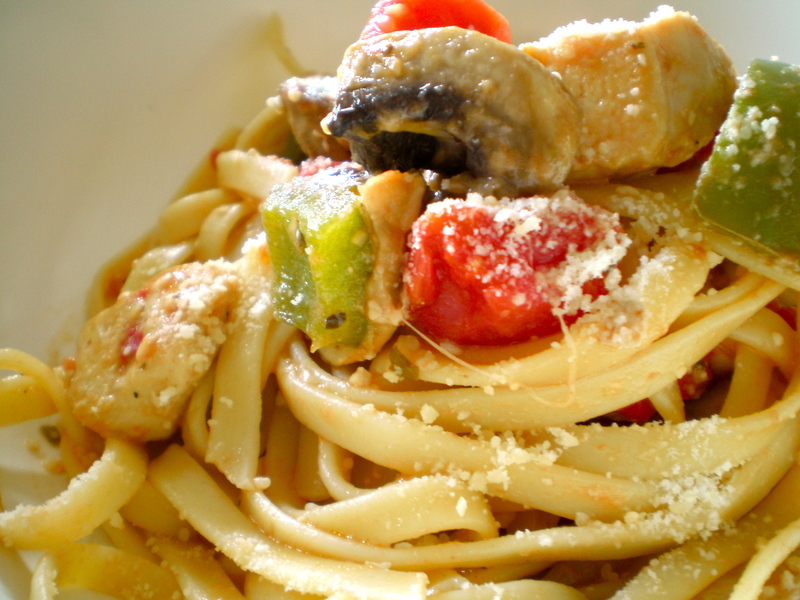 Last week I learned how to make spaghetti sauce and this week I came across this unique recipe called “Quick Chicken Cacciatorre”. Quickly skimming the ingredients, I stopped when I saw salad dressing as one of the main ingredients. You’re kidding, right? Did this recipe include a side salad? Nope. Okay so the sauce isn’t quite from scratch, but I was intrigued and therefore, I had to try it. Step 1: Bring a pot of water to a boil. I like to add 2 tbsp. of salt and a little olive oil to my water to flavor the noodles and keep them from sticking to each other. 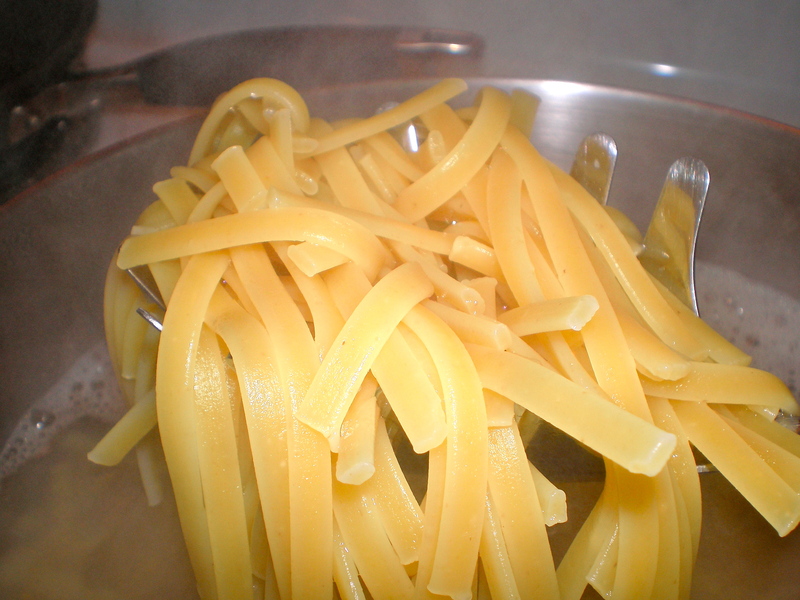 When the water is boiling, gather small bunches of fettuccine and snap them in half before adding to water. I find this helps when mixing the pasta with the sauce later on. Step 2: Allow the pasta to cook to al dente (about 9 minutes) or whatever they recommend on the back of the box. 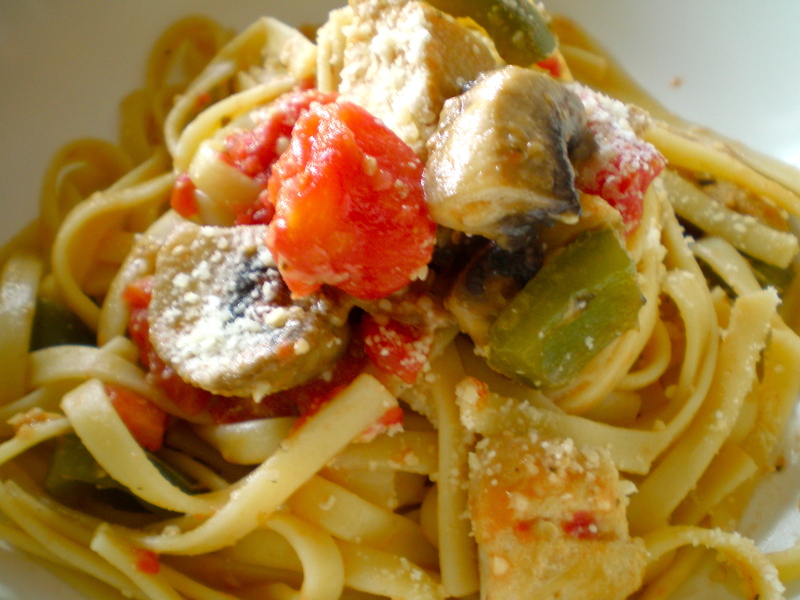 When done cooking, drain the water and shock the pasta in cold water to stop the cooking process. Set aside to drain & dry. 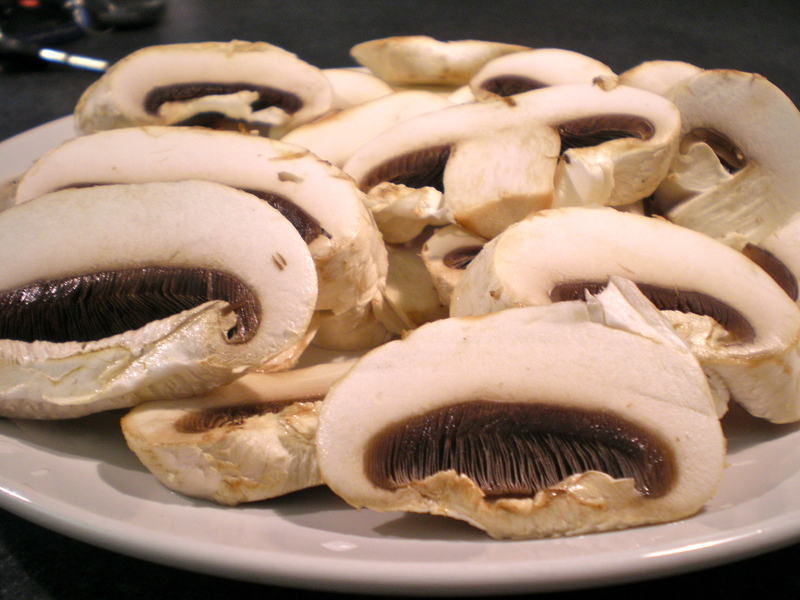 Step 3: After giving the mushrooms a thorough wipe with a damp paper towel, slice them into thick chunky pieces. I LOVE mushrooms so I prefer them in larger pieces. The slices pictured above were later cut into halves. You can also use bottled button or sliced mushrooms, but I prefer fresh ones. Place these in a bowl and set aside. 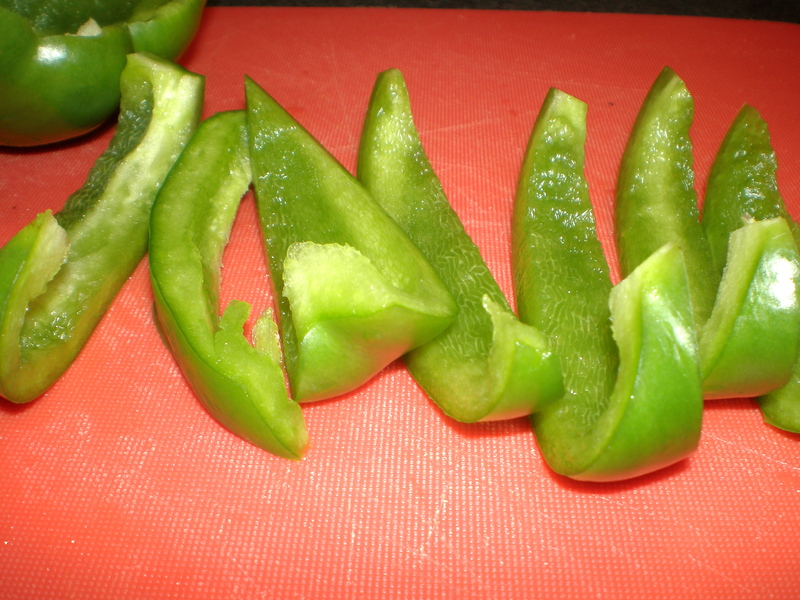 Step 4: Slice the bell pepper in half, remove the seeds, then cut into strips. You can leave them like this or cut them into cubes. Place in a bowl and set aside. 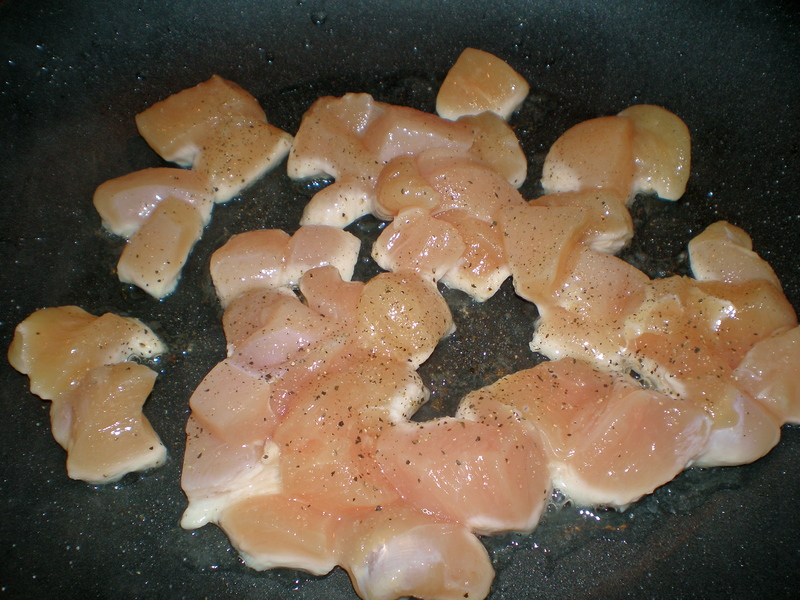 Step 5: Give the chicken breasts a quick rinse and trim off the extra fat. 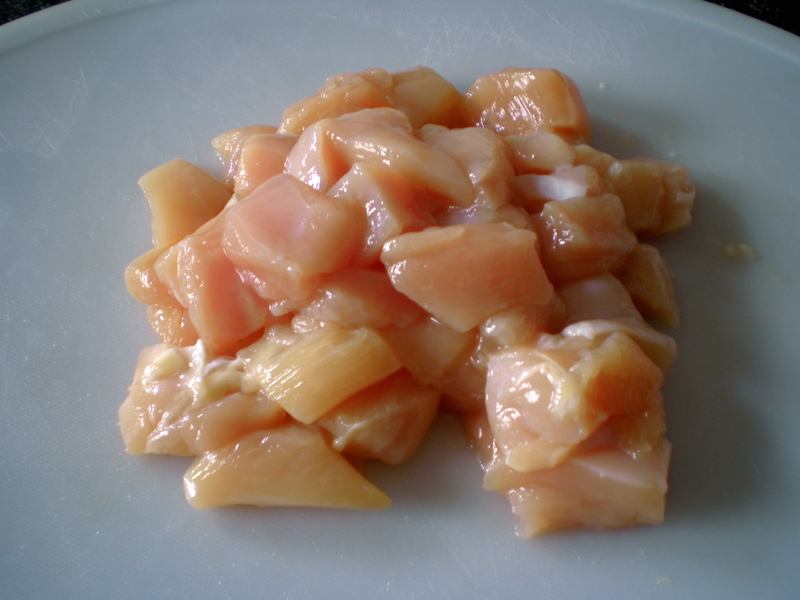 Step 6: Cut the chicken breasts into cubes. Step 7: Heat a non-stick frying pan on medium with about 1-2 tsp of olive oil. 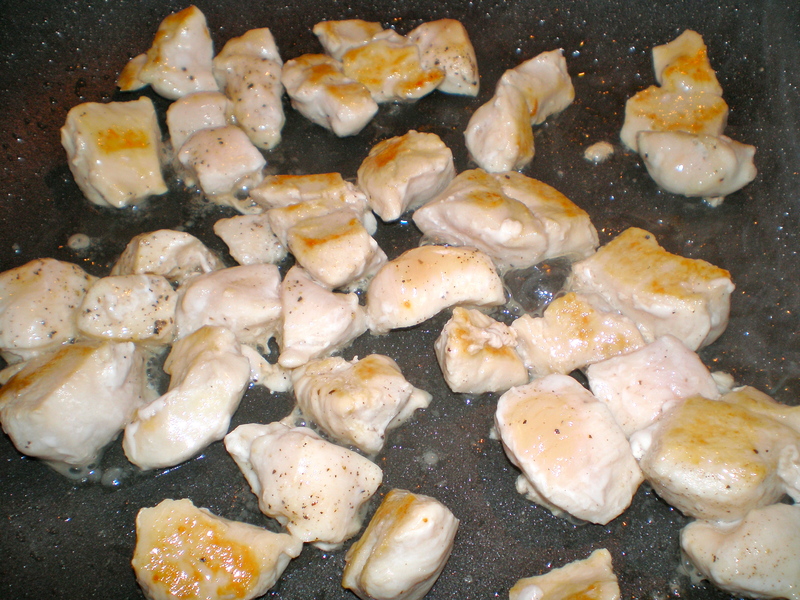 When hot, add the chicken breasts and allow them to cook for about 3-4 minutes before flipping them over. Season with a sprinkle of salt and pepper. Step 8: First of all, I love it when chicken breasts brown this way. 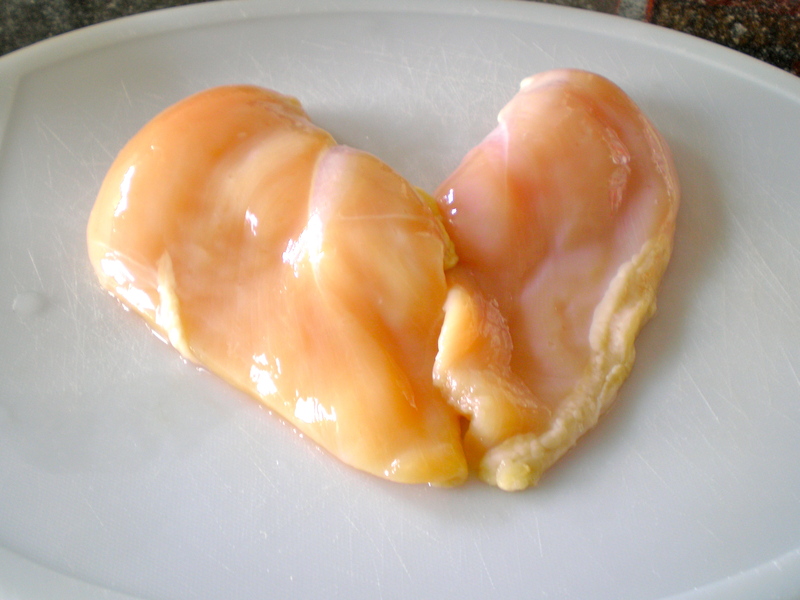 MmmMmm that golden-brown goodness is what makes my heart melt. 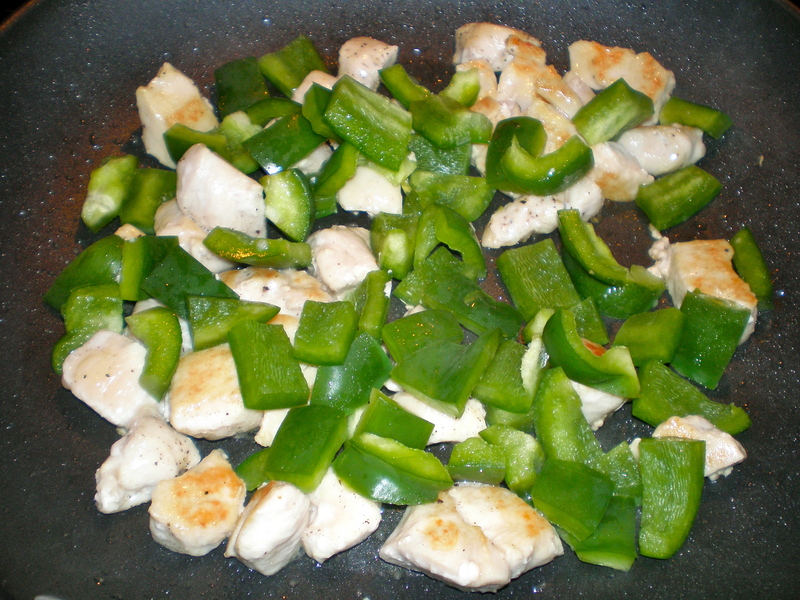 Step 9: When the chicken is no longer pink, add the green pepper and mix, mix, mix. 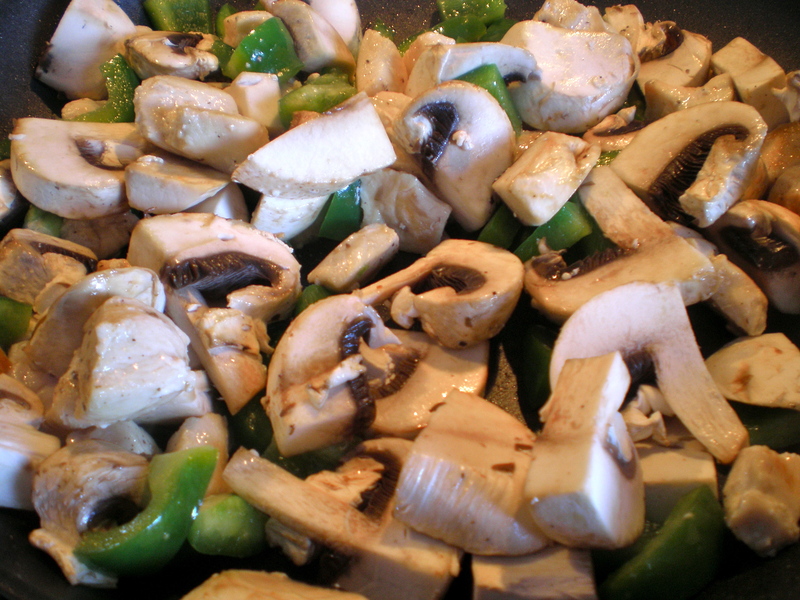 Step 10: Add the mushrooms right after the peppers. Mix and allow to cook for 3-5 minutes. Heat is still on medium. Step 11: Add the diced tomatoes. You can definitely use fresh tomatoes and you’ll have to season them with oregano, thyme and basil but it’s easy. I’ll do another post about it sometime. For this recipe, the key word is “quick” so I have no qualms about using canned in this case! 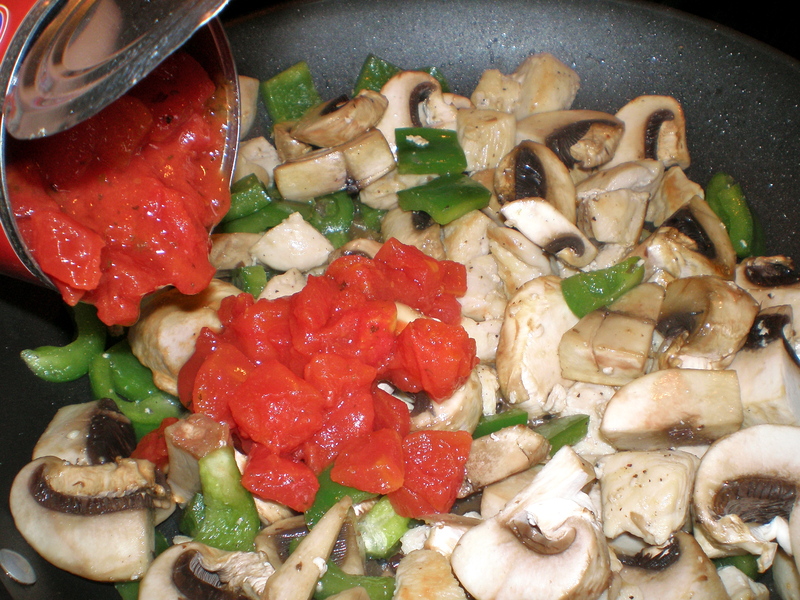 Step 12: Taste the sauce, taste the chicken, taste the peppers, taste the mushrooms, taste everything! Adjust salt as needed. Tasting should not be saved for last – especially when dinner guests are involved! Step 13: Add 1/4 cup of the Italian dressing. Insert hesitation here. I didn’t want to feel like I was eating a pasta salad (which is the first thing I think of when I put salad dressing and pasta in the same sentence) and the tomato sauce already smelled wonderful on its own..but…I did it anyway. 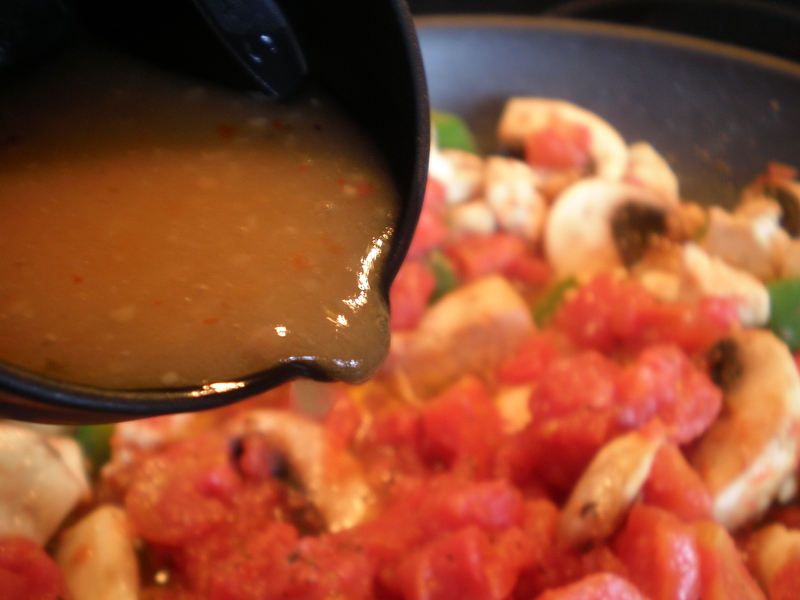 Step 14: Transfer the sauce from the frying pan into a bigger pot. Or, if your frying pan is large enough to add a whole box of cooked fettuccine, no need to move. 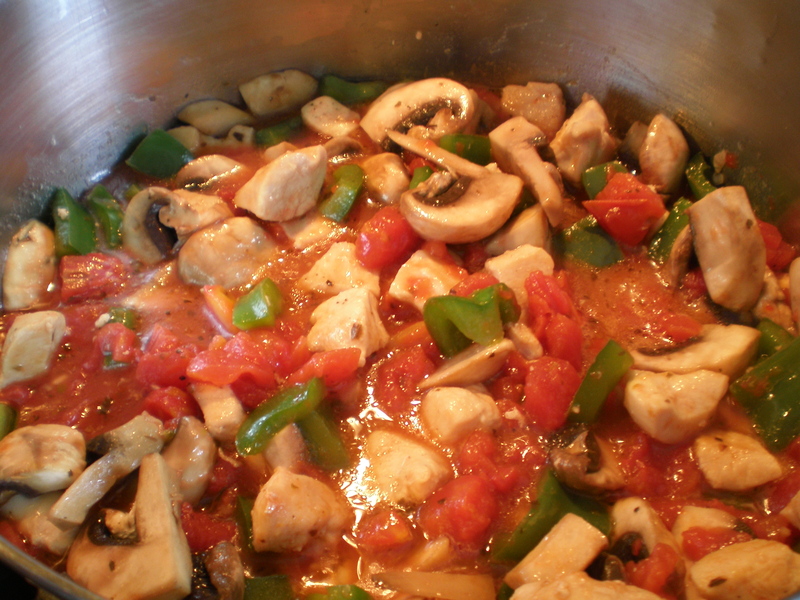 Step 15: Turn the heat down to medium-low and allow sauce to simmer for 5 minutes. Taste again. Add salt if needed. 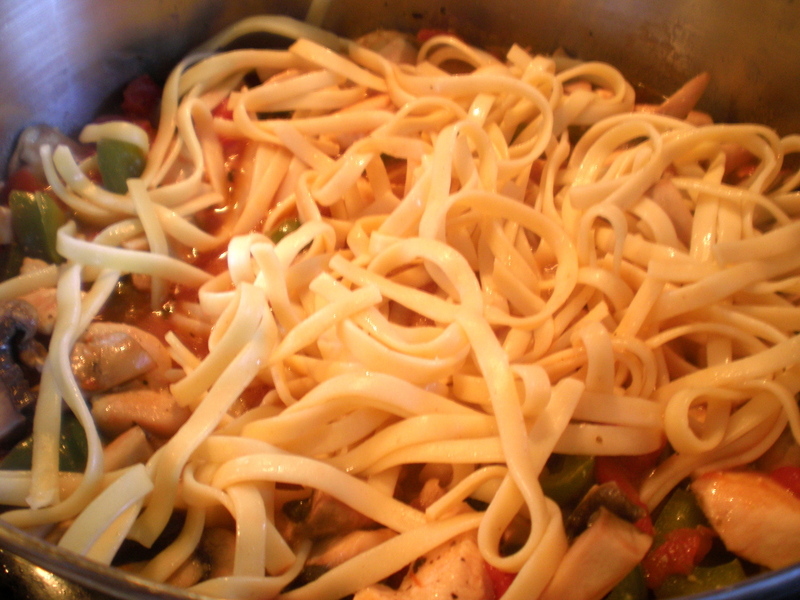 Step 16: Toss in the fettuccine and mix, mix, mix until the sauce and pasta are equally combined. Step 17: Divide equally among guests and sprinkle a generous amount of grated or shredded Parmesan cheese. Upon first bite, I thought, hmmm not like pasta salad at all!! It was simple, delicious and satisfying. The dressing complimented the tomatoes in a way I didn’t expect. The sauce was light yet very flavorful. I would recommend this for a weeknight dinner or even lunch because of its sheer simplicity and ease. Mmm, I love Italian dressing in any recipe! Haha. 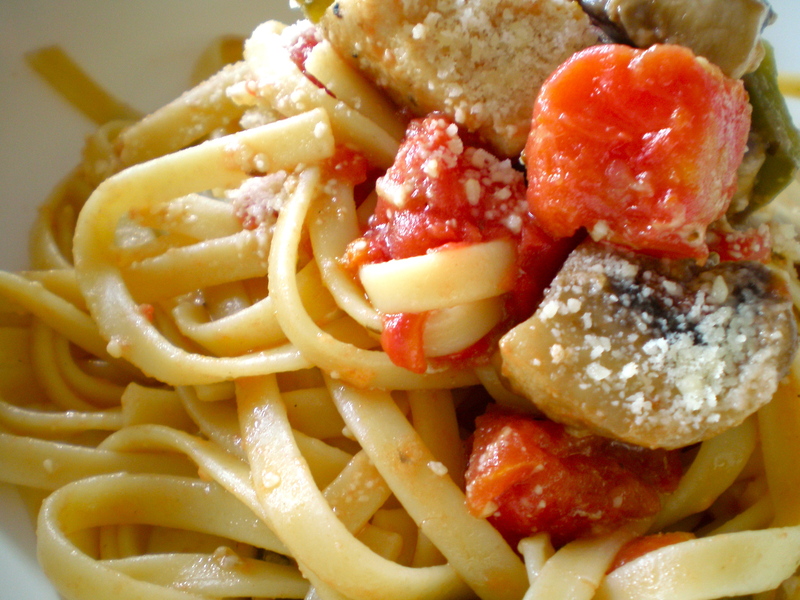 I will def keep this recipe next time I feel like having pasta! Thank you! And if you loooove cheese, don’t take it easy on the mozz and parm, i found myself adding more than what’s suggested hahah! I don’t know how you can take a picture after each step. I’m afraid I’ll burn what I’m cooking cause I take so many pictures at once. But anyways, looks yummy, jedd! and easy too! Thank you! You’re right, taking pics while cooking can get hectic and burning is always at the back of my mind!! But I just try to roll with it and get the best pics I can at the moment — and trust me I take a lotttt knowing I’ll only pick a few in the end.